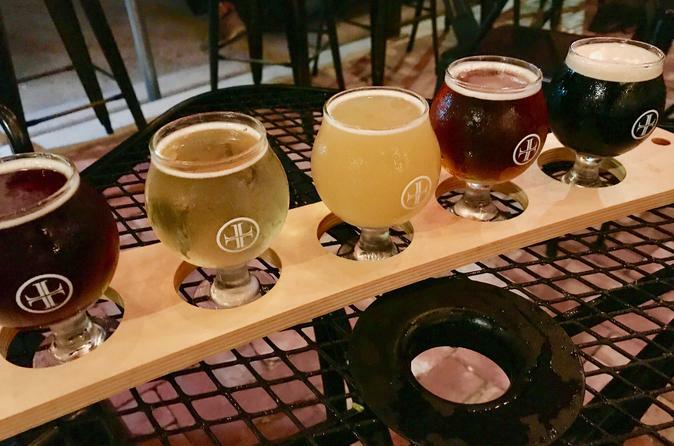 Delve into Texas’ craft beer and brewing scene, and sample some of the diverse beers in production on this guided, beer drinking tour in Houston. Explore some of Houston's favorites brew drinking spots by open-aired electric vehicle with your guide and visit three of the city’s top craft breweries. Sample over 10 different craft brews along the way, and hear the back-stories behind the beers and breweries themselves from each locations brewmaster. Following pickup from your Houston hotel/accommodation (Downtown/Eado/Midtown only) or in front of the George R Brown Convention Center, sit back and enjoy the breeze in an open-air electric shuttle for this beer drinking tour. During this 3-hour tour, you will stop at three of the best breweries and craft beer establishments in Houston. You will cruise around to sample over 10 different craft microbrews at some of Houston's best breweries in EaDo and Midtown. Once we arrive at our first stop, we will meet the brewmaster and tour the stills while learning all about the brewing process and history of the brewery. The beer drinking begins as we sample some the breweries great craft beer. What started off in the owners garage 8 years ago with a $100 home brew kits, your second stop has grown to one of the favorite local breweries in Houston. Sit back and relax on the outdoor patio as we sample some of the best brew Houston has to offer at this great indoor/outdoor brewery. We will be feeling hungry at this point, so at our third stop we will fill our bellies with not only beer, but the Houston Famous S.L.A.B Fries. It's no wonder our third stop on the brewery is one of our favorites, with beers all named to pay homage to the great city. After you have explored all three breweries you will be dropped off at your original pick-up location.